I know this isn't the prettiest picture ever, but I just had to show you the progress in Baby Girl's room. You know about the chandelier and the new artwork, and over the last couple of weeks we've finished all the trim and started priming. 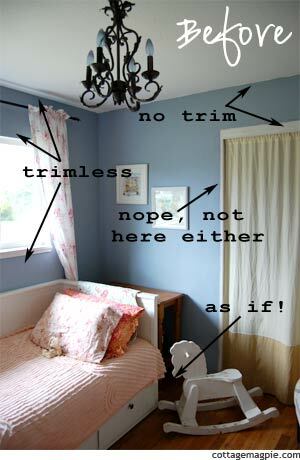 But, you say, trim? 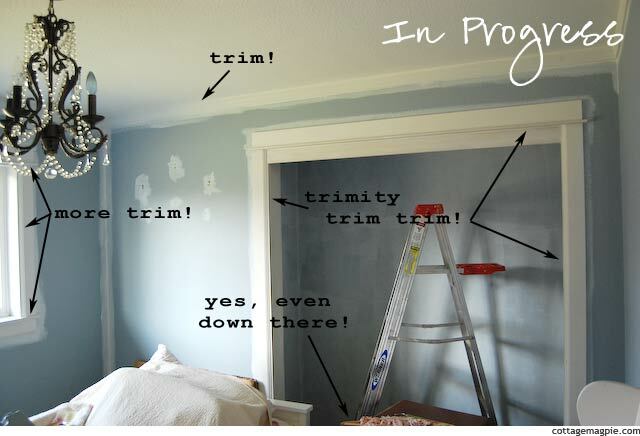 Didn't that room already have trim? No, no it didn't. See? I hate to be obnoxious, but it looks pretty awesome, doesn't it? And my favorite part? The moulding was only about $75. Woo hoo! Of course you know I'm dying to panel the ceiling like I did in the bathroom and cover the closet walls (oh heck, all the walls) with beadboard. But I'm trying to be sensible here, since this isn't our forever house. Can you see it? I'm starting to see it! Oh yes, and it doesn't hurt that I've been collecting up inspiration pictures like nobody's business. I'll share those soon. Meanwhile, I'm painting away. We had a couple of crazy over-scheduled weeks, so things took a bit of a pause, but we're back on track this coming week to start getting things done. Especially since this room is going to double as a guest room and guess what? We're having guests in early May! Nothing like a little deadline to get you motivated! !